Snowy Scheme storage levels are referred to in different measurements, they being ‘Active Storage’ and ‘Gross Storage’. Active storage is the water that generally can be accessed by either pumping or through release via dams or through power stations. Gross storage is the total amount of water behind the dam wall including the water than cannot ordinarily be accessed due to the design of the Scheme infrastructure. For the purposes of our business operations, active storage is used, whereas recreational users are generally more interested in and familiar with gross storage. For example, Lake Jindabyne could experience a 0% active storage level but the lake itself would be then at approximately 44% gross storage. This remaining water cannot be accessed via the pumping station due to the physical design limitations of the Scheme. Snowy Hydro makes the levels of our larger storages available to the general public, these being Jindabyne, Eucumbene and Tantangara. We do not publish the levels of our smaller storages because the levels rise and fall both rapidly and frequently in order to meet our operational requirements. At the end of the 2016–17 water year, Snowy Scheme active storage was 2,307 gigalitres. This is equivalent to 43.5% of the Snowy Scheme active storage capacity. 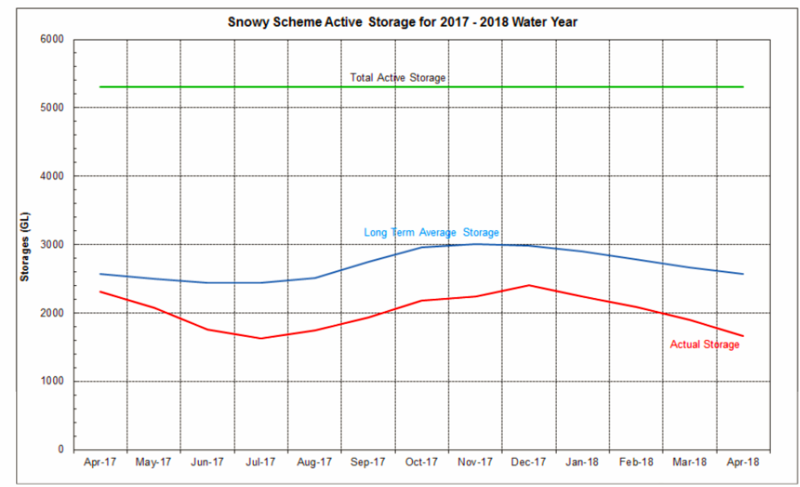 During the 2017–18 water year, Snowy Scheme active storage decreased by 650 gigalitres, with active storage totalling 1,657 gigalitres at the end of the year, which is 31.2% of the active storage capacity.